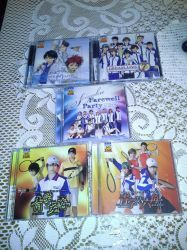 Dear Members, Watchers and Fans of this fabulous Mange/Anime series "The Prince of Tennis". I am happy to welcome you to this group, which I decided to found, because I am a big fan of this Anime and actually I wanted to search for more fans and artists. I hope, you'll like it and maybe, you know some artists to join this group soon. Thanks a lot and lots of love.